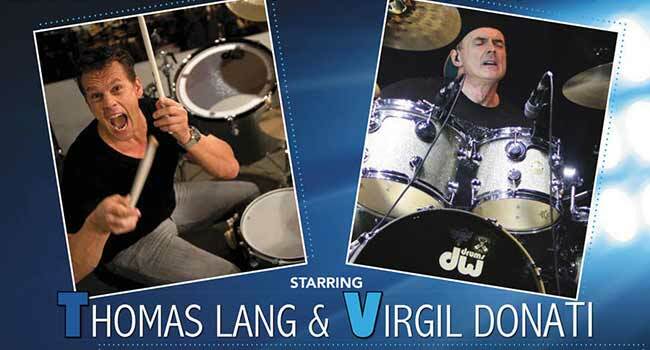 HomeScene NewsScene News: Virgil Donati & Thomas Lang: Tour Starts This Week. Limited Spaces Left + Competition! 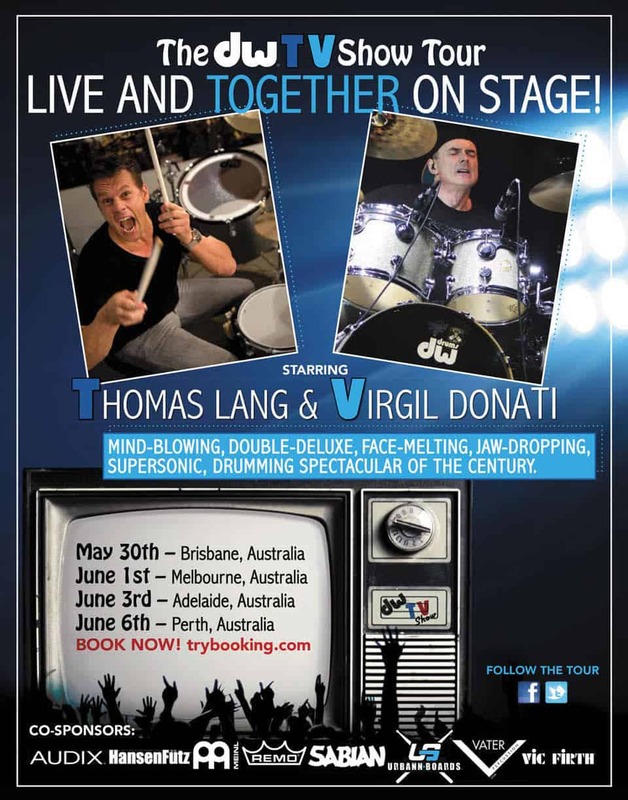 Scene News: Virgil Donati & Thomas Lang: Tour Starts This Week. Limited Spaces Left + Competition! Superstar drummers, Virgil Donati (Alan Holdsworth/Planet X) and Thomas Lang (Paul Gilbert/stOrk) will headline the “DW TV Show” tour. 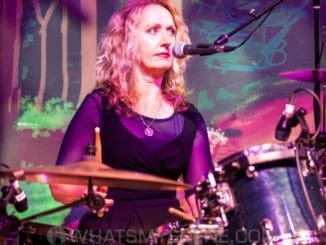 Sponsored by DW Drums, the 5-city tour of Australia, will also include an appearance at the Sydney Drum & Percussion Show. The DW TV Show marks the first-ever time these two technical titans have performed on stage together. A true WORLD EXCLUSIVE! 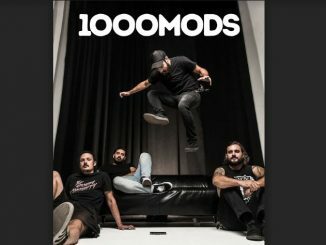 Just 14 left in Brisbane – Get in Fast! A Double-Deluxe Thomas Lang & Virgil Donati LIVE Pack! Enter our mind-blowing, face-melting, jaw-dropping, drumming COMPETITION of the century! There arew 4 double passes and Limited Edition DWTVShow T-shirts to giveaway! It’s been viewed an incredible 51K times! 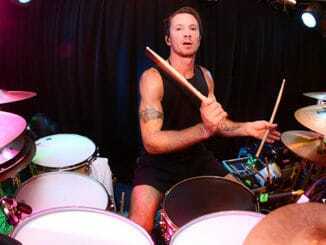 Not bad for a couple of drummers! “Thomas and I have been friends for a long time and it has always been a goal of ours to get out and do something together. I’m excited to finally make this happen,” said Donati. 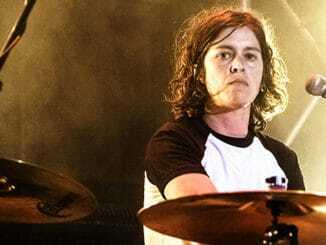 Both Donati and Lang will perform using DW Collector’s Series Drumsets which will be available for sale via the local retail sponsor after each tour stop. Additional sponsors include: Audix, Hansenfutz, Meinl, Remo, Sabian, Urbann Boards, Vater, and Vic Firth. “The phrase ‘once-in-a-lifetime’ gets thrown around a bit, but I feel like this truly is a once-in-a-lifetime chance to work with Virgil and I hope the audiences feel the same way about getting to see us perform together live on one stage,” said Lang. Founded in 1972, Drum Workshop, Inc. is a family-owned and operated musical instrument company best known for designing and manufacturing award-winning drums, pedals, hardware and accessories under the DW® and PDP® banner. In 2014, the company expanded to include other iconic American instrument brands such as Gretsch® Drums, Latin Percussion®, Gibraltar® Hardware and Ovation® Guitars. DW’s wide range of products is endorsed by many of the world’s top artists including: Neil Peart, Phil Collins, Chad Smith, Sheila E., Melissa Etheridge, Mick Fleetwood, Don Henley and Dave Grohl among others. Drum Workshop, Inc. is headquartered in Oxnard, California.